The fully illustrated definitive guide to publishing your book on CreateSpace and Kindle with Microsoft Word 2007, 2010, & 2013. You see, it's written by an author with 20-years of experience with MS Word, who designs Word templates professionally, who understands the ins-and-outs and the pitfalls, and, more importantly, who knows not only what you should do with Word, but also what you shouldn't. Believe it or not, Word is not geared for creating books. See how many book templates you can find among the flyers, menus, resumes, student reports, events, etc., in Word's template library. Sure, you can do it yourself, many do - very successfully; but, Word's underlying structure is the same now as it was back in the 1990's when Russ started using it professionally. And there is a learning curve with Word - you're probably aware of this though? So, maybe you've already experienced intense Word frustrations? Maybe you've had hours, days or even weeks of work thrown away - because of Word. The author, Russ, did in his early days. He struggled for years at first (it was pre-Internet days). However, if the only barrier to you successfully self-publishing your book is the software you're using, then there's something drastically wrong, isn't there? But, how do you learn to do 'all of this' correctly (and professionally), and in a non-biblical timescale? You take the best advice from a proven professional. This 174-page book fully-illustrated book guides you step-by-step through every part of creating, writing, formatting, and publishing your book, leaving nothing to chance. How to setup Word to work FOR you BEFORE you start - Word 'out-of-the-box isn't the best setup for working. How to setup your book for CreateSpace - CreateSpace and Kindle have different requirements, the process is different, so you need to understand this. Why getting it right from the outset makes a major difference - this will save you time, frustration, & heartache! 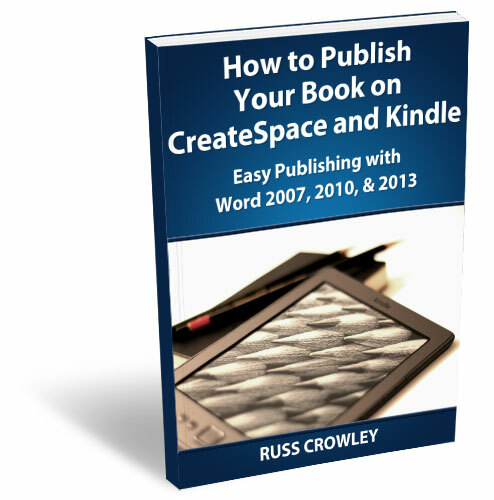 How to publish to CreateSpace and KDP - step-by-step so it's impossible to go wrong. Why you SHOULD NOT use CreateSpace’s facility to send your books to Kindle - it is a no-no, find out why. So, why waste your own valuable time? If you use Microsoft Word and have struggled, then you need rock-solid, detailed, easy-to-follow steps to ensure your success. ...and DON'T EVER LET IT GO! Get this book and begin your success NOW!